The catalogue has been written and prepared by Martin Crampin, in collaboration with Nigel Callaghan of Technoleg Taliesin Cyf. and the National Library of Wales. The site architecture was initially developed as part of the Imaging the Bible in Wales Project (2005-8), which was directed by Martin O'Kane. This catalogue inherits work done by the project team on the Imaging the Bible in Wales Database, particularly written texts by Martin Crampin and John Morgan-Guy, and further data entry by Charlene Crampin. Further assistance by the project's advisory panels is also acknowledged. 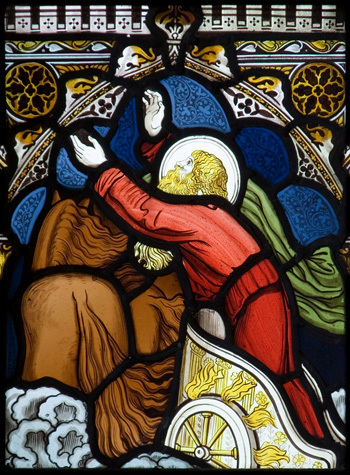 New texts have been added with additional images and indexing by Martin Crampin as part of the Stained Glass in Wales Project from 2009, with advice from John Morgan-Guy and Alun Adams. Contributions from others have been noted in specific instances. This survey would not have been possible without the help of clergy and members of the congregation who kindly arranged for churches and chapels to be opened, and sometimes provided further information about the work listed here.